King Richard I ordered the construction of a dockyard in Portsmouth, and granted the town its first charter, in 1194. 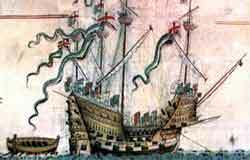 Eighteen years later, his brother King John instructed that the dockyard be enclosed "by a good and strong wall". Henry VII had built the world's first dry dock in the dockyard in 1495. It was designed by Sir Reginald Bray, architect of the Henry VII Chapel at Westminster Abbey. Henry VIII made the dockyard his fleet construction centre, and when Charles II created the Royal Navy in 1670, he gave Portsmouth the status of Royal Dockyard. With this came new slips, wharfs, storehouses and the first stone docks. The Great Ship Basin and six surrounding dry docks - one now occupied by HMS Victory and another by Mary Rose - are one of the surviving legacies of the great age of sail. Sail's golden age, between 1750 to 1850, saw the yard at peak production because of almost continuous war. To this period the dockyard owes its glorious brick storehouses, residences, and ropehouse, the latter rebuilt after a famous arson attack by Jack the Painter, a sympathiser with the cause of the American rebels. 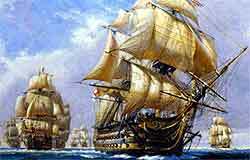 In 1800, the Royal Navy had 684 ships and the yard was the world's largest industrial complex. The age of mechanisation provided the world's first steam powered factory, the Blockmills, opened in 1802 to mass-produce ship pulley blocks. The machinery was designed by Marc Brunel, father of Isambard Kingdom Brunel. Another world first in that year was the caisson, or floating dam, which was installed at the entrance to the enlarged Great Basin. It was filled with water to keep it in position. When the water was pumped out, it floated out of the dock entrance. It was wide enough for a road to run across the top of it. The end of the Napoleonic Wars resulted in huge layoffs. The work force dwindled to 2,200 in 1822. This was only temporary as soon the development of steam propulsion heralded the yard's greatest expansion to date. 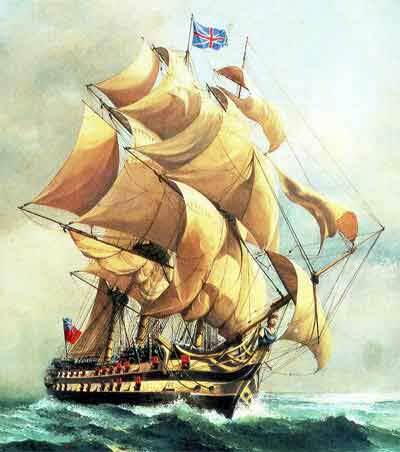 Within 20 years, the work force had trebled and in 1829, the yard built the world's first steam screw warship, HMS Fox. Expansion was relentless during the 19th century. Factories multiplied and huge new docks were constructed. By Parliamentary decree, another 180 acres were added in 1864. 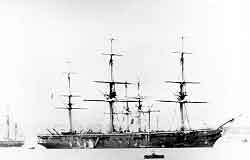 HMS Colossus, Portsmouth's first steel ship, was launched in 1882. Portsmouth Royal Dockyard's greatest achievement was only, however, reached with the construction of the Dreadnoughts at the beginning of the 20th Century. HMS Dreadnought built in record time was the first major warship with steam turbines. New basins and locks were created to cope with the demand. Then came the super-Dreadnought, the first oil-fired battleship, HMS Queen Elizabeth, launched in 1913. The yard played a crucial role in Britain's success in both World Wars. However, because of defence cuts, the frigate HMS Andromeda, launched in 1967, was the last of the 286 Portsmouth-built ships. Further contraction saw the work force fall to 8,325 in 1978 and to 1,400 currently, with a temporary revival in between because of Falklands War in 1982. The Royal Dockyard title disappeared in 1984, but the Naval Base remains the home port of the Royal Navy. Ships based at Portsmouth include the aircraft carriers HMS Invincible, Illustrious and Ark Royal, Type 42 destroyers, Type 23 frigates and Hunt and Sandown class mine countermeasures vessels. Portsmouth Dockyard houses some of the rarest ships and relics in the world, now under the banner of Flagship Portsmouth. In one place you can visit the Mary Rose, HMS Victory and HMS Warrior (1860). Our historic naval dockyard is the world's leading maritime heritage centre. Portsmouth Historic Dockyard attractions can be visited in any order. However, timed tickets are issued for visiting HMS Victory. Exhibition: a display of the Tudor 'treasures' found aboard. There is also a 15 minute film about the raising of the hull shown every half hour. You are recommended to visit the exhibition before seeing the ship hall. Guided tours around Admiral Lord Nelson's flagship at the Battle of Trafalgar 1805 (and the flagship of Admiral Sir John Jervis at the Battle of St. Vincent - 1797). Tours take approximately 45 minutes. Please arrive at the ship 5 minutes before the tour time on your ticket. Transcripts of the tour are available in most languages. Queen Victoria's magnificent warship to explore at your leisure. Deck plans are provided before you go aboard (available in English, French, German and Spanish) and audio information wands are available for a small additional charge. The story of the Royal Navy and its people over 800 years. Dockyard 500 exhibition: explains the pioneering technology that built Britain's most famous dockyard. Ship Hall: the hull of the Mary Rose. Audio commentary wands are available at the Ship Hall in English, French, Spanish and German. Dockyard Apprentice: displays the skills and crafts of the Portsmouth ship builders. Audio information wands are available from the reception desk in Boathouse No. 7. Historic Dockyard Trail: self guided walking tours around the heritage area. Audio information wands are available from the reception desk in Boathouse No. 7. Children's play area: The Fighting Top - children's themed play area in Boathouse No.7 - admission charge of 50p per child. Dogs: Dogs are not permitted at any of the attractions (except for guide dogs). Dogs should not be left unattended in the Dockyard.